Raspberry-topped mini cheesecakes are big on citrusy flavor when you add the grated zest from a large orange to the mix. Preheat oven to 325°F. Place 1 wafer in each of 12 paper-lined medium muffin cups. Beat cream cheese and sugar in large bowl with electric mixer on medium speed until well blended. Add sour cream, orange peel and vanilla; mix well. Add eggs, 1 at a time, beating on low speed after each addition just until blended. Spoon evenly into prepared muffin cups. Bake 20 to 25 min. or until centers are almost set. Cool. Refrigerate 4 hours or overnight. Meanwhile, drizzle chocolate evenly over remaining 12 wafers. Let stand at room temperature until chocolate is firm. Top each cheesecake with 1 tsp. preserves and 1 decorated wafer just before serving. Store leftover cheesecakes in refrigerator. 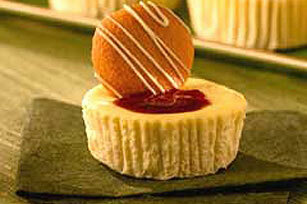 With their built-in portion control, these mini cheesecakes make a great treat. Prepare as directed, using grated lemon peel.